AN 8-YEAR-OLD in 1984 had a real issue with RTÉ, so she did what every 8-year-old would do and wrote a letter off to the then Taoiseach of the country Garret Fitzgerald to tell him her woes. 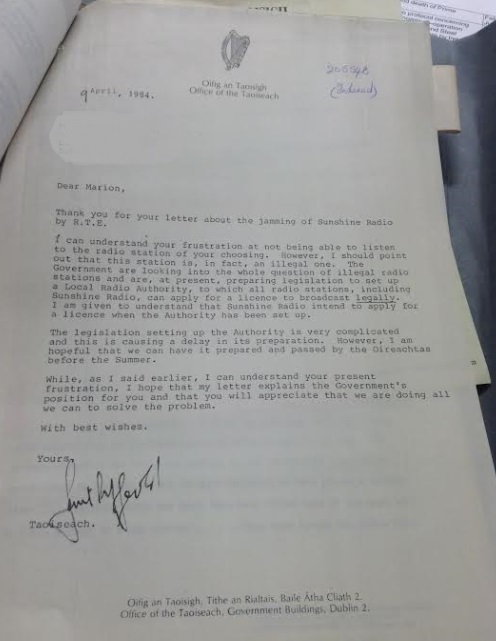 This letter from the Taoiseach’s files were released under the 30-year state papers rule and has probably been sitting in a filing cabinet for the past few years. At the time, illegal pirate radio stations were popping up all over the country and were a big headache for RTÉ and the Government. In an attempt to block the pirate radio stations, RTÉ sent out a jamming system to block their signals, which sometimes inadvertently knocked out phone lines also. Many were angry that the illegal stations could not get licences, and they, like Marion, let the Government know all about it. Email “This 8-year-old wrote to the Taoiseach in 1984 because RTÉ was 'mean to block sunshine'”. Feedback on “This 8-year-old wrote to the Taoiseach in 1984 because RTÉ was 'mean to block sunshine'”.